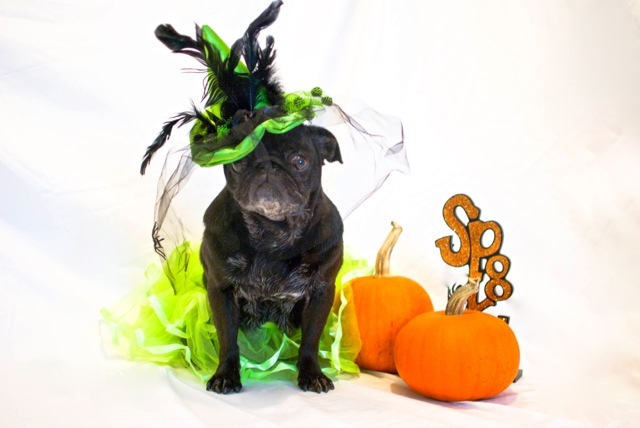 What better way to celebrate Pugoween than with a new costume and a photoshoot. …I’m going to have to give her extra treats for this one, aren’t I? 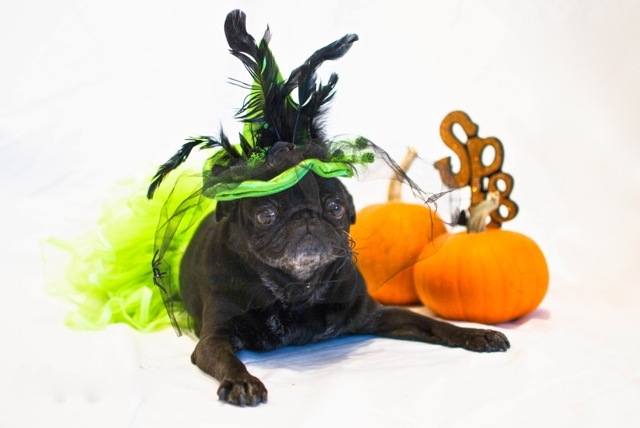 And just so you know that Lola Pug is not alone in her dress up fun, we will have not one, but TWO Pugalug Rescue Pugoween events to tell you about in our next post, and I promise there will be LOTS of photos, so stay tuned for more pugs in duds! Happy Halloween to all of our friends, and please remember to keep your animal companions safely indoors and out of harm’s way on this spooky evening. Lola! One of my coworkers is wearing the SAME hat this afternoon. She obviously has good taste if you’re sporting one, too! Did it look as silly on your coworker as it did on ME, Cat? Honestly. The things I do to keep my mama happy. She definitely deserves extra treats! You look incredible Lola! Don’t encourage mama, Carrie! OMP. I’m already dreading what she’s going to do for Christmas this year. We hope you got a pillow case full! I gave mama the cold shoulder for a little bit – that’s always satisfying! Don’t you mean *always* stunning, Hazel’s mama? I’m pretty much always pissed off. I think it adds to my puggie charm. LP, I know you aren’t a huge fan of dress-up, but you look freakin’ fabulous in that hat! Great Halloween photos! Can’t wait to hear about your parties.